Thousands of people have taken to the streets of Moldova’s capital, Chisinau, in anti-government protests demanding the dissolution of parliament and snap elections amid an ongoing political crisis. 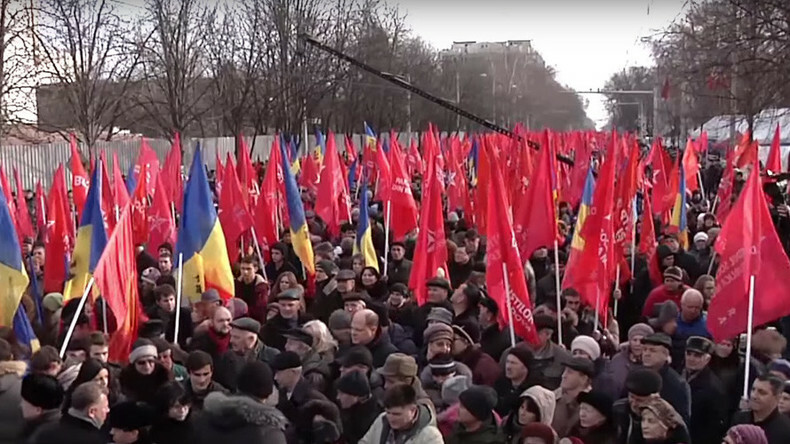 According to police sources, more than 20,000 joined three different rallies that were organized by both the left Socialist Party of Moldova and the central-right Civic Platform DA. The protesters call on the Moldovan president and chief prosecutor to resign, demanding early elections and prompt measures against corruption. They also oppose the nomination of the country’s Minister of Informational Technologies and Communication, Pavel Filip, to the post of the Prime Minister. Despite having common goals, Moldova’s right and left wing political forces are promoting very different platforms, RT’s correspondent on the scene, Nadira Tudor, reports. This is why their rallies were staged separately. The majority of the right is in favor of closer integration with Europe, while the Socialist block seeks closer ties with Russia. Moldovan President Nicolae Timofti named Filip, who is the third nominee proposed for the PM position, as a compromise candidate following two previous unsuccessful attempts to appoint a Cabinet head. “He is a compromise figure, who should receive a vote of confidence and resolve the pressing issues facing the country,” Timofti told journalists. “Filip has won support from the parliamentary majority of 55 lawmakers. As long as we are nearing the deadline for appointing a new prime minister, we have decided not to waste time. My previous nominee, Ion Paduraru, has withdrawn his candidacy,” President Timofti said, adding that the country’s parliament was obliged to approve a new government by January 29, TASS reports. Filip was proposed for the post of the PM on Friday after securing support of 55 out of 101 MPs. Timofti refused to nominate Vladimir Plahotniuc, the leader of the Democratic Party and one of the country's richest people, despite pressure from the pro-European coalition, according to Reuters. The nomination of Filip, who is vice-chairman of Plahotniuc’s party, is aimed at ending a confrontation between the Moldovan president and the Democratic Party, which won 55 seats in the parliament, securing a majority. Plahotniuc, who is also a former lawmaker, was one of the major targets of massive public protests over a corruption and banking fraud scandal that came to light in October 2015. The president said that Plahotniuc “fails to meet the criteria of a candidate for the post of prime minister,” TASS reports. The rallies on Saturday ended peacefully, but the protests are expected to continue as soon as the parliament announces a date for discussing the appointment of a new Cabinet headed by Filip. Moldova has witnessed political unrest for about three months, with tensions high on both sides of political spectrum. The country entered 2016 without a government amid unending mass protests that have lasted since early September of last year. Massive protests broke out in Moldova in the spring of 2015 after the media reported the theft of about $1.5 billion from three Moldovan banks prior to the 2014 parliamentary elections. The fraud drove the banks to the verge of insolvency and wiped out an estimated 1/8th of the country’s GDP. At that time, Moldova’s ruling Alliance for European Integration coalition was strongly criticized by foreign donors, including the European Union and the World Bank, which subsequently suspended their financing of the country.